Interested in colour signals and wondering about the best approaches to researching colour and what you should be reporting? Two recent papers from members of the lab and fellow researchers at Macquarie and elsewhere should help! In the first paper, Kemp et al. provide a framework for studying animal colour. This is not a how-to paper, but rather, its goal is a common intellectual foundation for studying colour in nature. The paper highlights the importance of receiver sensory systems and begins by discussing key perceptual principles including retinal photoreception, sensory channels, opponent processing, color constancy, and receptor noise. This is followed by a discussion of research-based questions in relation to the type of receiver (i.e. sensory system) and the viewer tasks. A decision-based approach can then be applied to decide if a sensory-based model is appropriate or if the visual task requires perceptual distance or discriminability measures. 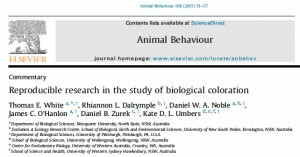 This paper places these approaches in a framework while discussing the future of animal colour research, particularly in terms of how animals perceive colour. The paper also highlights the importance of behavior as a driver of colour evolution and the need to work across disciplines in understanding colour signals. And as an added bonus, there is a very useful glossary of colour terms! Kemp, D.J., M.E. Herberstein, L.J. Fleishman, J.A. Endler, A.T.D. Bennett, A.G. Dyer, N.S. Hart, J. Marshall, M.J. Whiting. 2015. 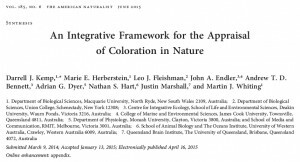 An integrative framework for the appraisal of coloration in nature. The American Naturalist 185: 705-724. Electronically published April 16, 2015. DOI: 10.1086/681021. In the second paper, White et al. tackle the need to carefully consider the details of how colour data is measured and what researchers should be reporting in their papers. This goes to the heart of science—ensuring that scientists are able to reproduce the research published by colleagues. The authors provide important guidelines for what methodological details researchers should report and review how well previous studies have reported these methods. In doing so, the authors provide a really comprehensive (i.e. very useful!) table detailing the information that colour researchers should report. Finally, the authors discuss the need for the public availability of data and code, which will go a long way in ensuring that colour research is reproducible. Scientists are increasingly making use of very large data sets in a wide range of analyses. As such, there have been a number of informal conversations about the need to begin compiling colour data such as spectral reflectance measures, from a wide range of study animals and systems, in a single, central database. This potential future endeavor will be made much easier if scientists deposit their spectra in an open-access digital data repository. White, T.E., R.L. Dalrymple, D.W.A. Noble, J.C. O’Hanlon, D.B. Zurek, K.D.L Umbers. 2015. Reproducible research in the study of biological colouration. Animal Behaviour 106:51-57.